My recent obsession with Korean Beauty products continue with this recent discovery of mine. It is the Tony Moly Magic Massage Pack. A face mask packaged inside an Über cute tomato shaped container, need I say more? Needless to say I’m a massive sucker for packaging, I just couldn’t resist this one and had to try it. I also hadn’t read any reviews on this product prior to buying it so my faith in it was placed purely on the Tomato design. However, after my first use I was sold… again. 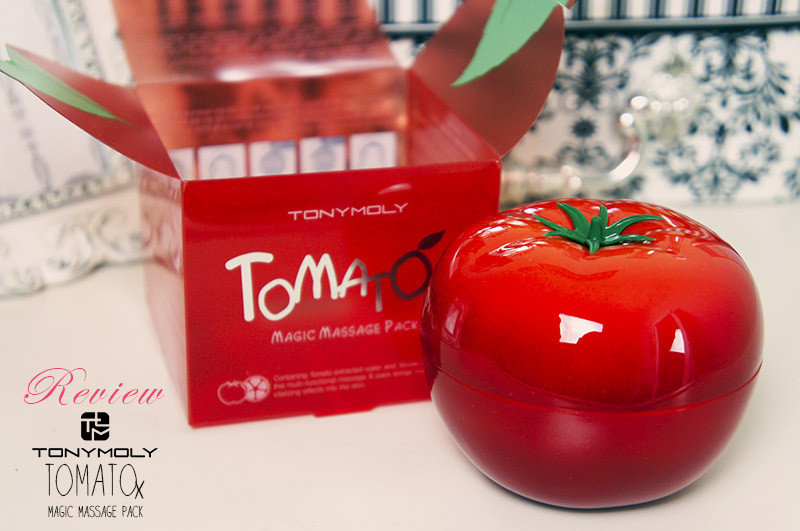 According to Tony Moly this massage pack contains Tomato Extracts to vitalise, clarify and hydrate the skin. I’ve only used it three times so far so I am yet to reap the long term benefits but I will base this review on the instant results it gives. Packaging: 10/10 It’s a Tomato. Tomatox Magic White Massage Pack contains fresh tomato and vegetable extracts. With the bright red granules of oxygen bubble, it purifies the skin and then provides a large amount of oxygen deep into the skin, instantly leaving the skin fair, smooth and delicate with an even tone. Tomato is rich in vitamins and minerals. It can get rid of the toxins of skin. The product is especially suitable for sensitive skin. Vitamin A and lycopene, the anti-oxidizing ingredients of tomato, are widely used in the pharmaceutical sector to help control puffiness and relieve chafing. Therefore, this product is suitable for sunburned skin, skin with accumulated melanin, as well as dull skin due to poor blood circulation or bad living habits. Consistency : Very easy to work with. The mask is almost like a lotion/cream. Not too thick like a clay mask and was very easy to smooth over the face. It dries to a sheer texture that is slightly tacky to touch unlike a clay mask which dries hard, tightens the face and cracks if you should dare smile or talk. I was quite happily chatting away with this mask on. I even forgot it was on my face. Fragrance: It smells pleasant and very fresh, its subtle though so I didn’t really notice it after a while. How to use : The box advises to wash the face and apply to damp skin. Before you leave it to set, you must give your face a mini facial by massaging it in for 1-2 minutes. Then when you’re done you leave it to settle on your face for 5 – 10 minutes. I always leave mine on for 10minutes for maximum benefit. Then to remove you wet the skin and gently pat off. The instructions tell you not to rub too hard when taking the mask off. I found that splashing the face with water takes the mask off quickly. The results: After my first use, I was impressed. My skin did look so much brighter and awake, and the texture more refined and smooth to touch. I could still see the benefits the day after as my make up seemed to sit nicer. It also gives me an instant rosiness to my complexion which I quite liked. Takes very little time to use. Good size with 75ml of product. There isn’t that many for me, but results are short lived and I find that I need to use this mask regularly to maintain the results. However it’s not a very expensive product so I guess it’s not that much of an issue. Have you tried this mask? What did you think? Tags: Brighter skin, Cosmetics, Korean Beauty, Massage Pack, skin care, Tomatox, Tony Moly. Bookmark the permalink. Does it improve the skin condition? not because it works for some it will work to everyone. It is my 2nd day applying tony moly tomatox and I noticed that it made my face even more rough. =( I don’t know if this is just the effect of detoxifying my face or it simply doesn’t fit my skin type. my friend suggested that i took it but it felt like i became even uglier upon using the product.